Here’s yet another sign that in the age of President Donald Trump and Environmental Protection Agency chief Scott Pruitt, the foxes are feasting in the coop. According to a report in the New York Times on Saturday, former George W. Bush administration official Dr. Nancy Beck has returned from a stretch with chemical manufacturer lobbying group the American Chemistry Council to serve as a top deputy in the EPA’s toxic chemical unit. In a confidential memo obtained by the paper, acting Office of Water assistant administrator Michael Shapiro warned Beck’s changes to how the agency tracks the health impacts of toxic perfluorooctanoic acid, which has been linked to a number of serious health conditions like cancer and birth defects, could result in “underestimation of the potential risks to human health and the environment.” It’s part of a pattern at the agency under Pruitt’s tenure; in the past few months, the EPA has backed away from bans of the pesticide chlorpyrifos, paint stripper ingredient methylene chloride, and degreasing and dry cleaning chemical trichloroethylene, all of which have been linked to serious health problems. During the Bush years, the Times noted, Beck drew criticism from some coworkers who believed she was more interested in rolling back regulatory requirements for industry than maintaining a cautious approach to public safety. She became “so aggressive in second-guessing EPA scientists” that she was called to testify before the House Committee on Science and Technology, which concluded she had slowed efforts to protect drinking water supplies from rocket fuel ingredient perchlorate. Beck eventually was forced out during the first term of the Barack Obama administration. Dr. Beck then spent her first weeks on the job pressing agency staff to rewrite the standards to reflect, in some cases, word for word, the chemical industry’s proposed changes, three staff members involved in the effort said. 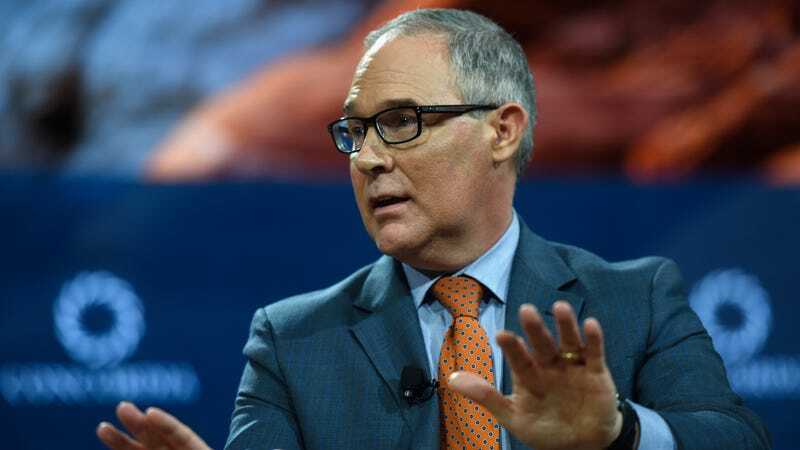 Specific changes Beck pushed for included strictly defining terms like “best available science” or “weight of the evidence,” which could lead to legal challenges of EPA regulations, or limiting EPA evaluation of chemicals to “intended” rather than “all” uses. Beck appears to have been remarkably successful with these efforts, and has even brought on other ACC veterans like toxicologist Michael L. Dourson. In the age of Trump, top scientific posts all across the federal government have been going to dubiously qualified people or industry-friendly lobbyists, while career federal science personnel have been choosing to pursue other opportunities. Over at the Department of Agriculture, for example, the White House picked a former right-wing talk show host and climate change denier to serve as the agency’s chief scientist; around the same time, USDA scientists were told to avoid discussing climate change. Trump’s NOAA has disbanded climate change advisory committees, his proposed NASA administrator struggles to understand basic planetary sciences, and science staff from the State Department to White House bureaus have been making rapid exits. All of this is happening very visibly. But the average person can’t really see toxic chemical-laced drinking water. All they can do is get very sick from it, sometimes a decade or more down the road, probably long after Pruitt and crew have made their exit to a cushy retirement.